These workshops are pre-booked online, but any remaining tickets are available for sale from the Workshop Enquiries desk. (Please book carefully as these workshops are non refundable or transferable). 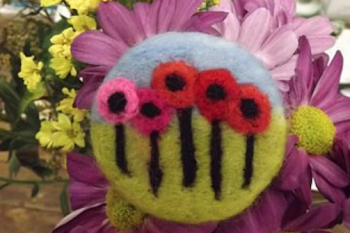 Try your hand at the addictive craft of needlefelting and make this pretty flower brooch using colourful, natural wools and a specialist needle. Perfect for a gift, or keep it yourself and wear with pride! Suitable for beginners and more advanced. 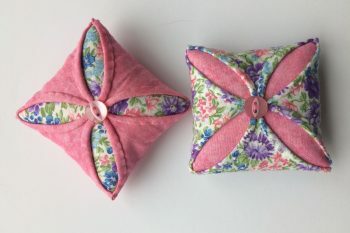 Create this pretty hand-stitched pincushion using the Secret Garden English patchwork technique, derived from Cathedral Window patchwork. You can incorporate it into many other projects, such as bags, cushions and quilts. All fabric provided by Pinflair, stand A38/B01 in the Creative Craft Show. Some experience of hand stitching preferable. Create a beautiful, unique brooch for yourself or as a gift. Choose a piece of wool felt for the background and embellish with constructed fabric, embroidery, beads, lace etc. A relaxing hour, but basic sewing skills are required. Fair Isle patterns are great for colour work. 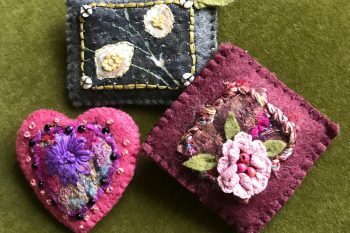 In this workshop you will learn how to change yarn colours confidently, read charts and choose colours to blend or contrast to add interest to your project. 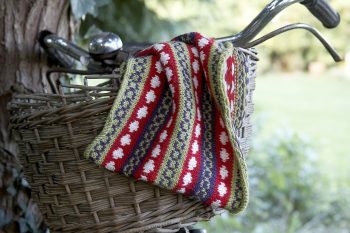 You will be given ideas of how to add Fair Isle designs to existing patterns to make them unique. We will discuss suitable projects for you to make using colour work.